The artist placed the viewer amidst the audience overlooking the orchestra and stage, reflecting the influence of artist Edgar Degas, as well as Japanese Ukiyo-e prints. He also introduced new hues into commercial poster art, which had previously been composed of primary colors. In Le Divan Japonais he incorporated shades of orange, green, and black to capture the tawdry character of the artificially lit nightclub. Le Divan Japonais was lent by the Paris-based dealer Eugène Druet. In New York it hung in Gallery K with some 185 graphic works by both European and American artists, including forty works by Odilon Redon that stole the show. In the foreground, silhouetted in a long black dress, is the popular dancer Jane Avril, here represented as spectator rather than performer; seated behind her is the critic and café habitué Edouard Dujardin; and performing on stage is the singer Yvette Guilbert, who can be identified by her long black gloves, despite her head being cropped off by the poster’s top edge. 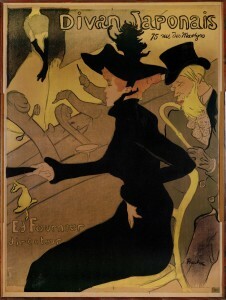 Russell Ash, Toulouse-Lautrec: The Complete Posters (London: Pavilion, 1991), plate 8. Colta Feller Ives, Toulouse-Lautrec in the Metropolitan Museum of Art (New York: The Metropolitan Museum of Art, 1996), 15-16. Götz Adriani, Toulouse-Lautrec: The Complete Graphic Works: A Catalogue Raisonné, The Gerstenberg Collection (New York: Thames and Hudson, 1988), 32. Gustave Geffroy writing in La Justice (February 15, 1893); quoted in Ash, plate 8. Four of his oil paintings also hung in the Armory Show: Red-Haired Woman Sitting in Conservatory (1889), Woman Sitting at Table, now called The Hangover (1889), La Tresse (1891), and Woman in Garden (n.d.). “International Art,” New York Evening Post (February 20, 1913): 9. Milton Brown, The Story of the Armory Show, 2nd ed. (New York: Abbeville Press, 1988), 320. Best known for his depictions of Parisian nightlife, the French painter and printmaker Henri de Toulouse-Lautrec moved to Paris in 1882 to pursue a career as a professional artist. He studied with the academic painters Léon Bonnat and Fernand Cormon, but quickly abandoned his conventional training to explore the practice of plein-air painting popularized by the Impressionists. Many of his paintings feature solitary female figures in intimate moments, seemingly unaware of the viewer’s presence. These works reflect that artist’s talent for capturing a figure’s inner emotional psyche, as he often emphasized their imperfections and vulnerabilities. In 1891 the artist began producing large-scale poster advertisements that were affixed to buildings, kiosks, and billboards across Paris, earning him immediate celebrity as a printmaker. Between 1891 and his early death in 1901, he produced thirty-one posters, including his most famous, Le Divan Japonais (1892-93). The Armory Show marked the first public exhibition of Toulouse-Lautrec’s paintings in America, although examples of his prints had been exhibited at Alfred Stieglitz’s 291 gallery in a solo exhibition in 1909 and in a group show in 1910. In the wake of the Armory Show, Toulouse-Lautrec’s popularity continued to grow in the United States and many American collectors, including Albert Barnes, Lillie P. Bliss, Nelson Gutman, and Abby Aldrich Rockefeller, acquired noteworthy examples of his work. Colta Feller Ives, Toulouse-Lautrec in the Metropolitan Museum of Art (New York: The Metropolitan Museum of Art, 1996), 13. Russell Ash, Toulouse-Lautrec: The Complete Posters (London: Pavilion, 1991), np. Sarah Greenough, Modern Art and America: Alfred Stieglitz and His New York Galleries, exh. cat., (Washington, D.C.: The National Gallery of Art, 2000), 543-547.